I have been gardening for enough years now to make a proclamation: I have a harvesting problem. I love to be in the garden. It brings me tremendous, uncomplicated joy. I start looking at seed catalogues when it’s still dark 16 hours a day. I love planting peas by St. Patrick’s Day and tomatoes by 4th of July. I love watching our seedlings grow and puttering around with my coffee cup and hose to make sure everything is good and damp before the sun gets too hot. I even get a jolt of destructive pleasure from ripping weeds out of the ground. But every year, the same thing happens. I watch the cucumbers flower and the peppers sprout and the tiny tomatoes start to turn pink. And then, I lose interest. This year, we had unpicked strawberries and withering blueberries and summer squash that were left to grow to the size of school buses. The basil bolted, and there are still figs on the tree. That’s not to say that we didn’t harvest anything. We did. We ate a lot of Greek salads and Caprese sandwiches, and there were nights we relied on the garden for entire meals. I made a few blueberry pies and garnished breakfast plates with handfuls of perfect Hood strawberries. But for whatever reason—like other years—I just wandered off and don’t finish the job with the same gusto I started it with. This, of course, is a trait I–ahem–recognize. I have drawers full of mostly done but not complete knitting projects and files of photographs sorted but not glued down in their albums and a wispy contrail of ideas in various stages of half-assed-startedness. And truth be told, for the past few months, I have been heavily dithering over revisions to a manuscript. Dithering doesn’t even quite cover it. Opening it. closing it. Sleeping over it. Tearing it apart. Putting it back together. Crying. Complaining to anyone who will listen. But not bloody finishing it. Last Saturday, I spent the whole day at a conference. When I came home, I was shocked to find that David had ripped out the garden. He—as he put it—was prepping it for the fall planting of kale and fava beans. He left the three winter squash plants, but it was Goodnight, Irene to the rest of it. 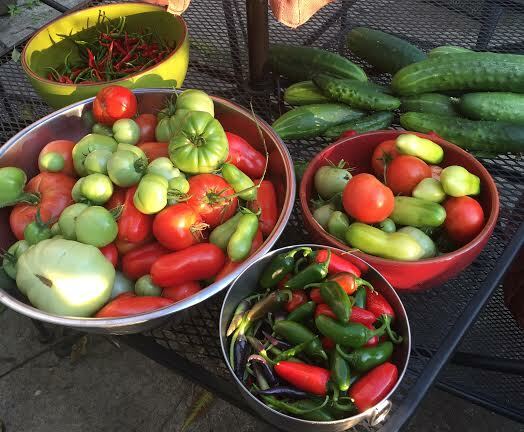 In the process, he picked every last tomato, red and green; all the cucumbers that weren’t the size of the children, and about 1,000 chiles and other peppers. So, as Neruda says at near the end of the poem: “it’s time!/let’s go!” I guess I’d better take his celebration of the harvest to my stovetop and my desk and get busy, despite my leanings to the contrary. p.s. – Here’s an easy satisfying hot sauce recipe just in case you’re in the same boat! Pulse chiles and kosher salt in a food processor until a coarse purée forms. Transfer to a 1-qt. glass jar, loosely screw on lid, and let stand at room temperature for 12 hours to ferment slightly. Today—and often—I am of divided mind and body, and probably divided soul as well. Last week I was in Baton Rouge, Louisiana and Tempe, Arizona. Next week, I will be in Boston Massachusetts and Washington, D.C. Today, I am in 97214, making crepes and trying to keep a sense of home on this little lot on a busy street, across from one of America’s beautiful parks. I walk outside multiple times a day to see if the rhubarb has any new leaves. (I am happy to report that as of last check-in, it does). In other words, I spend the weeks trying to understand the country, the weekends trying to understand this little spot, trying to be a good steward of both. I wonder how I am doing at either. My dear friend Daniel Kemmis once asked me: How do you feel about being part of national organization? How can anyone serve the whole country? That last question is one that lingers, that stings a little, that haunts. 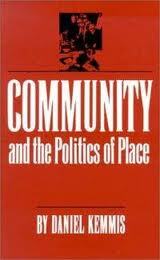 Truth is, Dan became my friend because I tracked him down and forced myself on him many years ago now after reading his fine, life-changing book Community and the Politics of Place. My old copy, that is tattered and full of notes and highlights, still sits on my desk. I refer to it in conversation at least once a month. It is now 23 years old, and the questions and provocations it raises are as relevant and necessary as ever. The thesis—which is deeply and overtly Jeffersonian—is this: “[T]he demise of public life has to be understood in terms of space (or place) as well as time. Putting it more positively, public life can only be reclaimed by understanding, and then practicing, its connection to real, identifiable places.“ That rings true as I talk to Louisiana legislators who reflect on the history of colonialism and settlement patterns and how they affect—even to this day—the relationship between the branches of government. And Oregon legislators talk about political identities that are not driven by party but rather by whether the individual represents a district on the East or the West side of the state. Water rich, water poor. Open land rich, open land poor. These connections to particular places and their history really matter in how issues are framed and ultimately how they are resolved. But on the other hand, there are a set of issues that seem to be neither locally created nor locally solvable: the power of wealthy special interests, the national sweep of term limits, the demise of local media outlets, winner-takes-all partisanship. Those issues are common across the states and seem to be driven by forces that are at least national—if not global—in scale. If that is the case, attempting to create entirely local solutions would be both inefficient and likely ineffective. Heat a lightly buttered cast iron pan over medium high heat. Pour or scoop the batter onto the griddle, using approximately 1/4 cup for each crepe. Tilt the pan with a circular motion so that the batter coats the surface evenly. Cook the crepe for about 2 minutes, until the bottom is light brown. Loosen with a spatula, turn and cook the other side. Serve hot with powdered sugar and lemon juice. Truth is—as my 13 year old says—I am not a simple woman. If given a choice between simple and complicated, I’ll go with complicated every time. It’s not even willful, it just is. My poems are contraptions teetering on the edge of collapse at all times, and sometimes plummeting directly over that edge. And, as my husband points out, because people are just like their poems, my life is complicated, too. It took me a long time to get here—twists and turns, mistakes, heartbreaks, bad behavior all around, years of agonizing over my own failures, J.D., M.F.A, the works. And now—even settled in here to our little corner of the world—my life is not simple. The girls are playing sports, practicing piano, looking for their dance gear, baking cookies, finishing homework, and often bickering, all at the same time. David and I are both running organizations, driving kids to and from lessons, maintaining friendships here in Portland and around the country and trying to think two thoughts in a row in order to write the occasional poem. In short, it’s complex, noisy, baroque, and sometimes, a snarled up mess. The laundry asserts itself in huge piles. And, I know we are not alone. Nearly everyone I know feels hurried and hassled. Every time we turn our attention to one crisis, another pops up behind us. There are days when I can’t even bring myself to read the newspaper. I wasn’t worrying about air quality in the Columbia River Corridor, and look, there it is, something real to worry about and fix. And climate change. And broken down schools. And incivility in Congress. And on and on. It makes me wonder if we have exceeded both our human capacity to respond to stimuli and our institutions’ resilience in the face of change. Maybe we don’t just feel like we are wobbling on the edge of chaos, maybe we actually are. Thomas Berg, in his fine new book on the Minnesota legislature—Minnesota’s Miracle—posits that part of public dissatisfaction with government is that it has become more and more impenetrable in order to deal with an increasingly complex and fast-paced world. He suggests that government feels out of scale to individuals because the society it responds to and is a part of has become out of scale. So, as we all careen from one thing to the next, some of it joyful, some of it necessary, some of it merely distracting, are there any safe harbors available to us? Strangely, for me, I have found one in the kitchen. Of course, by disposition, I am attracted to complex recipes and time-consuming preparations. I love to caramelize onions all afternoon for a melt-in-your-mouth French onion soup. I like curries that start with hand-ground spices and trifles that take three days to soak. But recently I have found other comforts as well—the comforts of fresh peas with butter, a strong cup of black coffee, a plain baked sweet potato. In short, I have discovered—or rediscovered—the pleasures of simplicity. I have always taken irrational joy in packing leftovers for lunch. I love stretching a pot of spaghetti sauce with a few extra tomatoes so that unexpected guests can stay for dinner. I adore a winter soup made from whatever’s in the crisper. Yes! That’s right, isn’t it? 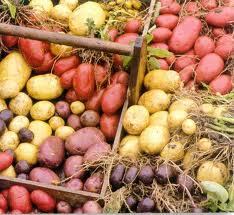 Cooking can be a place to slow down, to use what you have, to see and smell and taste fresh vegetables and simple herbs. It is a place where—like Adler—we can make tomorrow’s broth out of the scraps from tonight’s stir fry. It is a place where we can take control and pay attention. It is a place where radishes with butter and salt can linger on the tongue and in the imagination. It is—or can be—our safe harbor. Simple as soil yet crowded as earth with all. Flint chips, and peat, and the cinders of buried camps. Cooking and eating simply, re-experiencing the earthy potato, they bring me into communion—and solidarity—with farmers and truck drivers and cheese makers. They make me slow down and be grateful for what I have in the pantry and to reflect quietly—rather than frantically—on the suffering of my fellow citizens who can’t count on a handful of carrots and a pat of fresh butter. So tonight, when I make a winter vegetable soup and easy popovers for my family’s dinner, I vow to slow down. I vow to chop intentionally and gratefully and practically. And, at least for tonight, I vow to be a simpler woman. I am a woman of boyfriends. Or really more accurately, boyfriends and girlfriends. My current retinue includes David Brooks, Nancy Pelosi and Daisy Durham from the band Kitty Daisy and Lewis. For the moment, I’ve thrown over Lyle Lovett and Alexis deTocqueville. 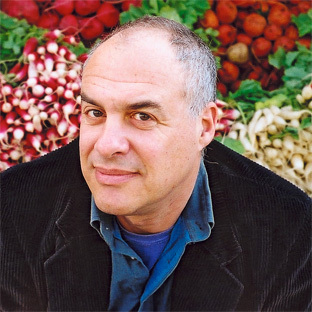 But, I am headed toward a major crush on the food writer, Mark Bittman. Last week, Bittman came to Portland to give lecture for Literary Arts, but I got the chance to see him at a taping of Oregon Public Broadcasting’s Think Out Loud. For readers of The Minimalist in the New York Times, he was satisfyingly irreverent and curmudgeonly, but I found him also to be deeply subversive. In the best way. Bittman gets cred—and much of his charm—from his lack of formal credentials: “I’m not a chef, and I never have been. And though I’ve cooked with some of the best-known chefs in the world, I’ve never had formal training, and I’ve never worked in a restaurant. None of which has gotten in the way of my mission to get people cooking simply, comfortably, and well.” He corrects people when they refer to him as a chef, and he calls himself as the antithesis to Julia Child (may she rest in peace). I knew all that about MB before I went to hear him in person, but in listening to him riff with the fine interviewer, Dave Miller, something clicked. Over the last few years, his writing has gotten increasingly political –the farm bill, GMOs, a seemingly endless series on the invasive species, the Lionfish. But, in hearing him talk informally, I started to understand why and how that shift toward political writing happened—a shift I deeply admire, thus elevating him to potential BF status. For years, Mark Bittman has been writing cookbooks and blogs and columns and making videos and doing interviews, all advocating that cooking need not be complex, expensive or needlessly time-consuming. Embedded in his work is the argument that food is central to life and culture, to family and community, and that we are at risk of degrading all of those things if we don’t preserve what he calls “real food” (or sometimes just “food” to distinguish it from other products sold to be eaten but have no nourishing qualities). In all this work, his stance is that food is sacred, but it is not precious. He cuts corners; he simplifies recipes; he democratizes good, wholesome and delicious food. He de-professionalizes cooking well and poo-poos the notion of the “celebrity chef.” And in that, he provides a road map to a saner and more robust political life. In the same era that we stopped cooking from basic ingredients and started accepting both mass-produced food products ready to microwave and the idea that “real cooks” spend six hours laboring over boeuf bourguignon, we also backed away from public life. We stopped going to meetings, to rallies. We stopped writing to our legislators and running for school board. We stopped voting. We ceded both the kitchen and the public square to the “experts” and—more dangerously—to huge, corporatized interests. And Mark Bittman, man, he’s not going to take it. He’s calling for us to reclaim our place behind the stove and in front of the committee hearing. He’s reclaiming both food and political action for the individual, for the family, for the community. Of course, that’s really my argument, not Bittman’s. But listening to him talk the other day, the pieces started to fall into place. As we empower ourselves to make a tasty winter stew from vegetables we can find in any supermarket, we then begin to ask the manager of that supermarket for fresher carrots, then we can start to think about the mass production of carrots and the working conditions of the people who harvested them. And then it’s the farm bill, and pretty soon we’re out there in the mix, advocating for the things that matter to us and our family. That’s a path out of this mess we find ourselves in, and it’s right there everyday in The Minimalist–but more importantly—in our own kitchens. And, if that doesn’t make MB boyfriend material, I don’t know what does. And besides, he can make a mean scallop gumbo.